Summary: It works with a programmed tooth management system that turns on the laser for a recommended treatment period. The laser toothbrush does not need toothpaste. That’s right. Here’s your opportunity to have Hollywood white, super-healthy teeth, thanks to this revolutionary, super-safe, medical-quality laser toothbrush. It has an energy concentration so low that any tissue surface, even eye tissue, is safe! It works with a programmed tooth management system that turns on the laser for a recommended treatment period (55 seconds). The laser toothbrush does not need toothpaste. This revolutionary semiconductor medical laser helps decrease sensitivity, toothache pain, inflammation, and even helps eliminate bad breath. 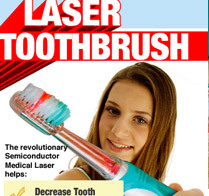 No more messy toothpaste accidents, now you can clean your teeth with light!